Fantasia Electronic Hookahs are at SouthSmoke.com. 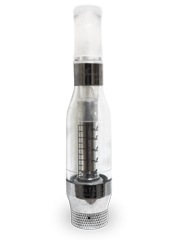 Try a Fantasia e-hookah and take your on-the-go smoking to the next level. 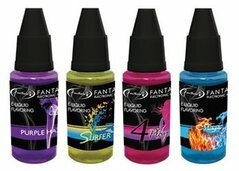 Fantasia is well-known in the U.S. hookah market for making unique hookah tobacco flavors that provide an intense smoking experience. Now those same flavors can be found in a modern, convenient form with Fantasia E-Hookah. Take your hookah wherever you go with a Fantasia electronic hookah, available now in both disposable and rechargeable starter kit from SouthSmoke.com! When you want the unforgettable flavors of Fantasia always at hand, you can't go wrong with Fantasia's Diamond Second Edition disposable e-hookahs. These e-hookah products are marvels of the hookah world, as they make smoking hookah more convenient and easier than ever. No set up is required - just choose your flavor and you're good to go! Fantasia E-hookahs are made from a glycerin-based flavor cartridge, an atomization chamber, as well as an LED indicator light that lights up when you smoke. 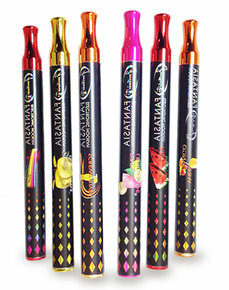 Disposable Fantasia e-hookahs last for approximately 800 puffs, which make them ideal when you want to try several of Fantasia's extensive line of premium flavors. Choose from the drop-down list on the product page and try them today! 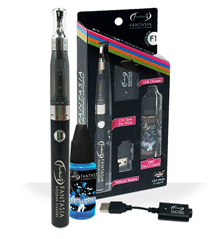 If you want to revisit the great taste of Fantasia hookah time and time again, you want to go with the Fantasia F1 Rechargeable E-Hookah Pen starter kit. The Fantasia e hookah starter kit gets you the great smoke experience you know and love but in a more portable size. The Fantasia e hookah pen starter kit hooks you up with everything you need for on-the-go hookah, including a USB charger, 900mah EVOD battery, one CE5 hookah flavor tank, as well as one 15ml Fantasia e-liquid bottle to start you off. Make sure you have more e-liquid on hand when you run out. Now that you've got hookah on the go, you definitely don't want to find yourself lacking! The appeal of Fantasia e hookah pen products are easy to see. Hookah pens are just like your normal, everyday hookah, only shrunken down to a size you can fit in your pocket. We at SouthSmoke.com are pleased to offer these products to you, as well as the best Fantasia hookah flavors available, all for affordable prices. Please browse our selection, and if you have any questions, don't hesitate to call us at 888-577-6653!